The FTD Friends Bouquet showers your favorite friend with love and affection offering them a gorgeous gift of flowers and beauty! Unforgettable lavender roses, purple carnations, hot pink gerbera daisies, green button poms and lush greens are brought together to create a simply stunning flower arrangement. 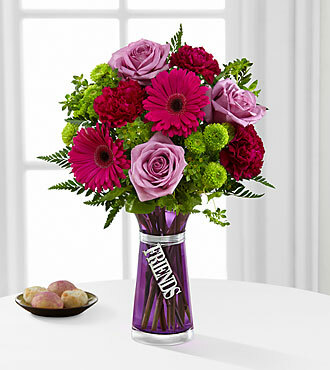 Presented in a designer purple glass vase with a silver metallic decorative tag that says "Friends."